After decades of failing to build anywhere near enough housing, California is waking up. A broad and diverse political coalition has emerged to get more homes built. This development should be cheered by all those concerned about the state’s housing crisis. But increased focus on the supply side of the affordability crisis has left some tenant advocates feeling left out. They see reforming the state Costa-Hawkins and Ellis Acts and state action to increase renter protections against evictions and rent increases as either missing or insufficiently addressed. Last week, these tenant concerns were publicized by Aimee Inglis of Tenants Together, a participant in the Committee to House the Bay Area (CASA). 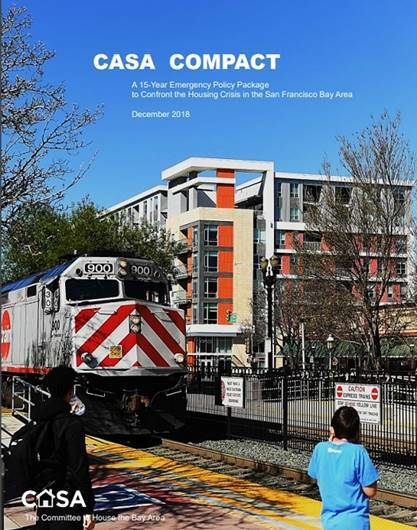 CASA is the largest and most diverse Bay Area housing coalition ever assembled. It seeks a comprehensive policy consensus to expand production and affordability, a very challenging task. The ten agenda items in the CASA Compact include many recommendations I include in my new book, Generation Priced Out: Who Gets to Live in the New Urban America. They are common-sense and long overdue strategies to get more affordable housing built for low-income residents and for expanding working and middle-class housing. CASA is not legislation. A legislator would either have to introduce the compact in the form of a bill or it would appear on California’s 2020 ballot. Tenant advocates raise two main criticisms. The first is that the Compact’s just cause eviction protections do not kick in until after the first year of tenancy. This delay was justified on the basis that most tenants start with one year leases. Yet conditioning just cause protections on a year of tenancy could quickly lead landlords to start offering only six month leases. I don’t believe this would happen—landlords have little economic incentive to replace tenants every six months–but the one year starting period has provoked concerns that should be addressed. CASA’s bigger problem with tenant protections is its allowing annual rent increases of the Consumer Price Index plus 5%. That’s typically 7-8% per year. San Francisco’s rent law limits annual increases to 60% of CPI, which usually results in raises under 2% annually. Considering most tenants are paying at least $2000 per month, this effort to tackle excessive rent hikes still allows increases of nearly $200 a month every year. And that’s in addition to the unlimited rent increases on vacant units allowed by Costa-Hawkins. CASA’s proposed statewide just cause eviction protections mean little without limits on rent hikes. Otherwise, landlords can easily get their “just cause” to evict by raising rents beyond what tenants can afford. So tenant concern about the excessive rent limit is understandable. And considering the California Apartment Association opposes even this moderate limit on rent hikes and opposes CASA, the Compact might as well get tenants fully on board by reducing the allowable rent hikes. But tenant advocates are wrong to blame developers for weaknesses in CASA’s tenant protections or for the lack of state legislative progress. Addressing the housing affordability crisis is not a zero sum game. Gains made in building housing do not come at the expense of enhanced tenant protections, and action is essential on both problems. Big Real Estate is its own power. For over a decade it has controlled the state legislature. Considering that Prop 10’s November defeat is widely if incorrectly viewed as a setback for rent control, CASA’s expansion of tenant protections should confirm that those involved with the Compact are not the opposition. Since the 1970’s, two factors have determined tenant power in Sacramento: legislative leaders as allies and grassroots power. Tenant gains in Sacramento have long depended on powerful State Senate allies. Senate leader David Roberti stopped Costa-Hawkins for years and San Francisco’s John Burton won major Ellis Act reforms as well as the partial restoration of the State Renters Tax Credit. Tenants have never recovered from the loss of Burton to term limits at the end of 2004. Renters only major legislative gain since that time was David Chiu’s 2018 bill to extend the response time for unlawful detainers. That’s not a lot to show for a nearly fifteen year period when California rents have gone through the roof. Chiu has probably done more for tenants than any other legislator but his rift with Tenants Together founder Dean Preston over San Francisco’s Parkmerced housing development has left the group estranged from the San Francisco Democrat. Nor does Chiu have anywhere near the power that Senate leaders Burton and Roberti wielded. Sacramento requires getting leadership on your side. Under Senate leader Bill Lockyer, we got nowhere with restoring the Renters Tax Credit; when Burton replaced him we got $250 million a year for tenants because John Burton wanted it done (See my 2004 piece, “John Burton: A Hero of Our Time“). Tenants have also suffered a decline in grassroots power at the state level. When Christine Minnehan was the Sacramento lobbyist for the Western Center on Law and Poverty, tenants had an advocate who once worked for David Roberti and was trusted by legislators. Nobody can match the Capital connections Christine brought for tenants. Minnehan’s insider power was combined with a thriving CA ACORN, which focused on tenant issues and brought top-level staff (like Brian Kettenring, now with The Center for Popular Democracy) to Sacramento. Amy Schur, now head of ACCE, would convene a statewide network of labor, tenant and community groups for Bay Area and Los Angeles meetings to plan state legislative campaigns. Under Schur’s leadership tenants won some big improvements to state code enforcement and other tenant gains; today, ACCE has nowhere near the resources of CA ACORN. Tenants Together has bolstered local tenant groups and campaigns but has not had much success winning key state tenant legislation. It lacks the labor connections that CA ACORN enjoyed and is operating in a much more real estate dominated political environment. The AIDS Healthcare Foundation, which spent roughly $25 million on Prop 10, was unknown in state tenant circles prior to the 2018 campaign. Since the election the group has been vocal on Twitter but has yet to get any major tenant bills introduced this session. So tenants entered 2019 with nowhere near the political or grassroots power of the coalition promoting housing development. Governor Newsom is all in on building housing but was not considered a tenant ally as a supervisor or mayor of San Francisco. So a CASA compact that imposes statewide just cause eviction with a cap on rent increases was probably seen by development types as a huge concession to tenants. Landlord groups certainly felt so, which is why they are leading the CASA opposition. What should tenants do to get more power in Sacramento? Flood the offices of legislators with calls, visits and rallies demanding action on Ellis Act and Costa-Hawkins reform. That’s what the pro-housing coalition is doing on their core agenda, and that’s what legislators in Sacramento need to see before taking on Big Real Estate. The year is young. There is still time for tenant advocates to get key legislation introduced. And while the odds remain tough given Big Real Estate’s clout, a bill cannot pass if it never gets introduced. Randy Shaw is Director of the Tenderloin Housing Clinic and author of Generation Priced Out: Who Gets to Live in the New Urban America.